The Ironman Kona race is the big daddy of Ironman events. While the Ironman triathlon series has events all over the world, from Australia to Brazil to Germany and everywhere in between, the Ironman World Championship takes place every year in Kona on the Big Island of Hawaii. If you don't know what an Ironman is, it's a 140.6 mile triathlon race that consists of a 2.4 mile open water swim, a 112 mile bike ride and a 26.2 mile run. Yup, you swim more than two miles in the ocean, bike 112 miles through sun scorched lava fields, and then top it off with a full marathon run! Needless to say, this is an elite athletic competition. The men's winner of the Ironman Kona will typically finish in just over 8 hours and the women's winner in just under 9. And that's the professional triathletes—participants can take up to a grueling 17 hours to finish (that's the cutoff time). It's pretty inspiring to watch runners crossing the finish line late into the night with hundreds of people still at the finish line loudly cheering them on. 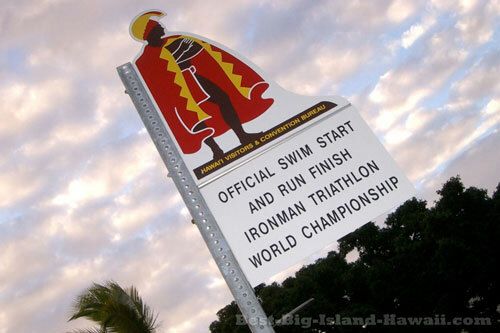 The world championship Ironman starts and finishes in downtown Kailua-Kona, at the Kailua Pier. From there, racers swim south (roughly parallel to Ali'i Drive and the shoreline) for more than a mile and then turn back towards the pier. Then they transition to the 112 mile bike ride that goes north from downtown Kona onto Highways 19 and 270. 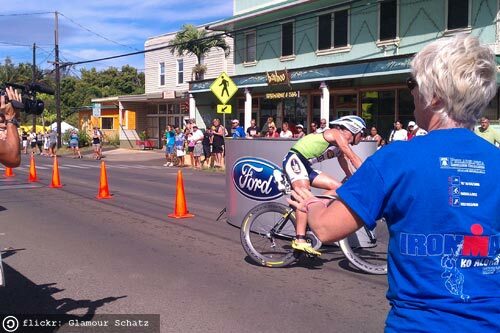 Like the swim, the bike ride is a there-and-back course with the turnaround in the town of Hawi. Finally, the run portion is a circuit that stretches north and south of Kona all the way up to the airport on the north side and down to Keauhou on the south end of Kona. Check out these detailed course maps of the swim, bike and run. October is Ironman month in Kona and it's a good thing to be aware of if you're planning a trip. 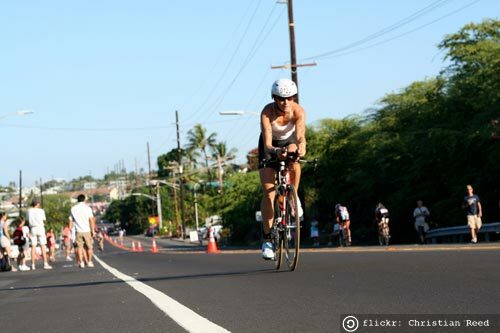 You might love to be a part of the action as the crowds of athletes, trainers, spectators, journalists, sponsors descend upon Kona for this huge event. Or you may want to avoid the crowds and schedule your trip accordingly. If you are going to be on the Big Island in October, the Ironman Kona is a really exciting event to be a part of. Of course, if you're an elite athlete or are really dedicated, you might have your sights set on competing in the Ironman in Kona. 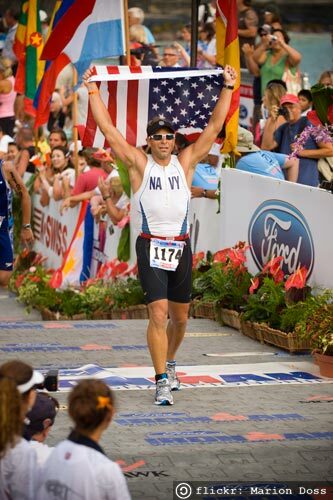 For the rest of us, enjoying the Ironman race as a spectator or volunteer is the next best thing. The most crowded areas for spectators is the area in downtown Kona near the pier where the swim start and the run finish of the race happen. As you can imagine, parking is an absolute nightmare in downtown Kona during the race, so it's best to plan on being on foot. While the swim start is an amazing sight as hundreds of racers splash in a tangled frenzy, you can't really see the swim up close and personal like you can with the run and bike portions of the race. Most spectators will set up somewhere along the course to cheer as the runners and bikers zoom by. A lot of spectators are friends and family of one of the nearly 2,000 participants who are trying to get a glimpse of their star triathlete in the race of their lives. For a great story on what it's like to be a spectator in Kona and a supporter of a racer, check out this blog post. It takes many many local volunteers to make the Ironman World Championships a successful event and volunteers come from around the world to help out. Volunteers help with everything from registration to medical support to passing out water and food and giving after race massages. There's really a job for everyone and volunteering can be a fun way to get an up close and personal experience of the race. Plus you get a free t-shirt! Check out this series of blog posts for one volunteer's experience of the Ironman Kona. Interested? Sign up here. The bike course turnaround in Hawi. However you plan to experience the Ironman Kona—as a participant, spectator or volunteer—you'll want to thoroughly check out the Ironman World Championship homepage for details, FAQs, and essential information that will help you make the most out of your Ironman experience.